Here are the upcoming 2040 Comprehensive Plan meeting dates. 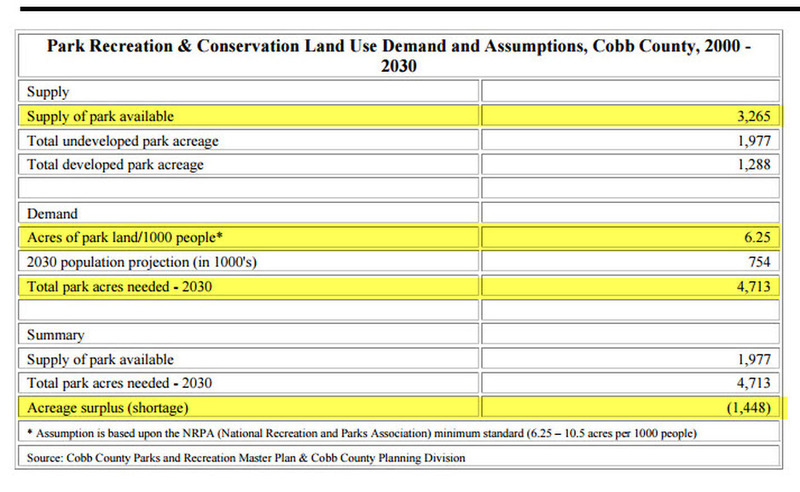 One of Cobb County's goals in the 2030 Comprehensive Plan has been to acquire at least 1,448 acres as parkland, just to maintain that 6.2% level. 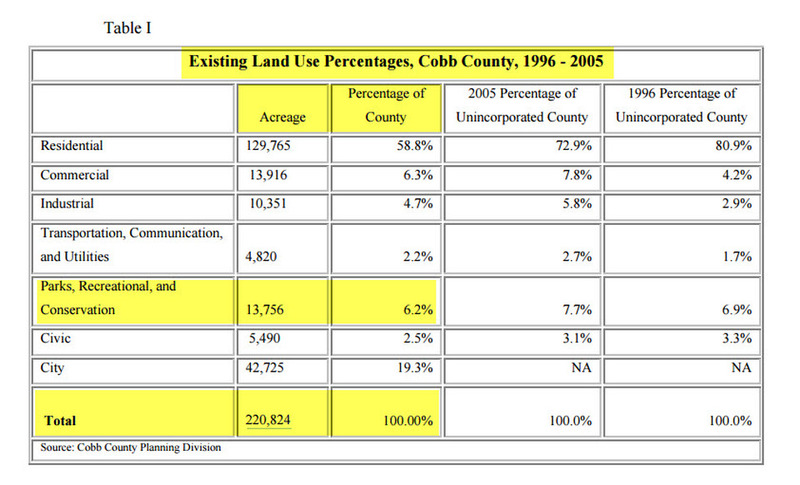 The new 2040 Plan should include these acreage goals for parkland. 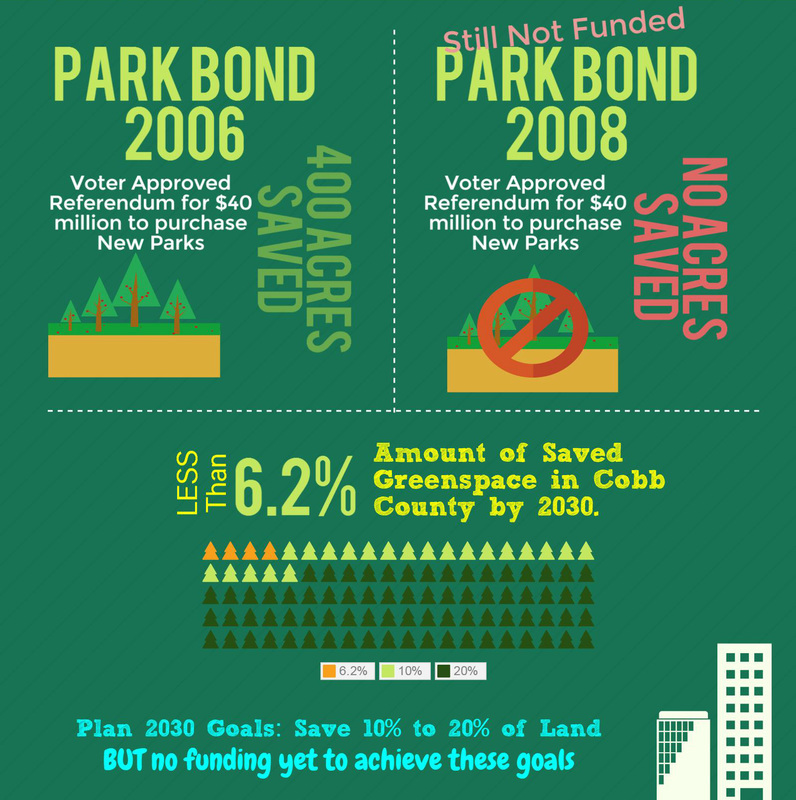 The Park Bond 2008 Referendum on the ballot for $40 million to purchase parkland property was overwhelmingly approved by voters in 2008, but Cobb County has not yet issued it. The $40 million Park Bond should now be issued as a first step in acquiring parkland acres. Many of the properties to purchase with 2008 Park Bond have been developed, and the amount of residential land available for purchase has been shrinking. The time is now to save the land before it is all developed. Currently Cobb County parks per people ratio is below the National Recreation and Parks Association (NRPA) standard minimum of 6.25 acres of preserved greenspace per 1,000 people. The NRPA standard is 6.25-10.5 acres per 1,000 people. 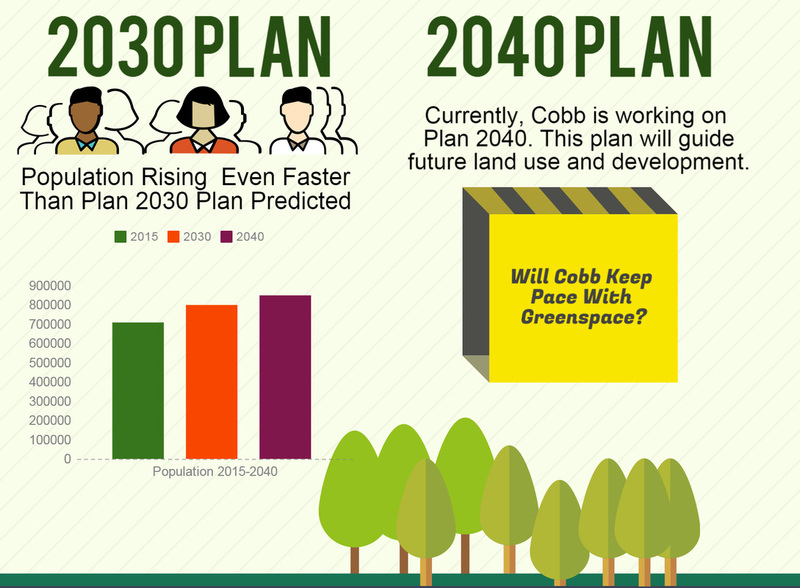 To achieve the lowest standard of 6.25 acres per 1,000 people, Cobb County needs to purchase at least 1,448 acres before 2030. The National Recreation and Park Association (NRPA) standard is 6.25-10.5 acres per 1,000 people, so more land should be purchased to get the amount of preserved land closer to 10 acres per 1,000 people. 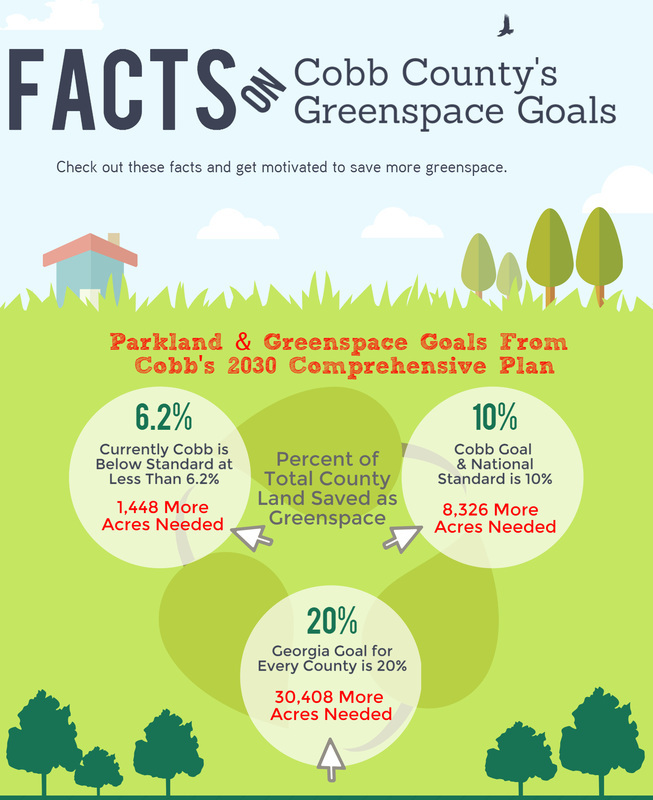 Cobb County has only 6.2% of all county land preserved in either parks or greenspace, yet the standard is at least 10%, and in 2000, Cobb County became a partner to the state-wide Georgia Greenspace Program to preserve 20% of all county land. The Georgia Greenspace Program became the Georgia Land Conservation Program, which offers grants to counties taking steps to save county land.